I have a nasty cold, it’s only getting worse as the days go on. I’m lying in bed and someone starts pounding on my door. I realized exactly how alone I am in Texas. Anybody could be on the other side of that door and there is not one thing I have to protect myself. Not even a voice because its half gone with my cold!! I ignore it but the pounding continues so I answer it. There is a young gal standing on my front porch, my neighbor come to find out. She is moving and wants to know if I want her couch!! I was like, sure! I was going to order a red couch but a free couch is much better!! So her guy friend helps me move the couch. It was kinda funny cos when they walked in, I was listening to old rap from the 80s. I don’t quite look like I would be listening to that! I put the couch in the living room and the girls start hissing and Viktoria is growling her head off!! They were just standing at the couch and making kitty noises. I go lay back down and then I hear a weird yowling. I got back up and Viktoria was sitting in the floor hissing at the couch. 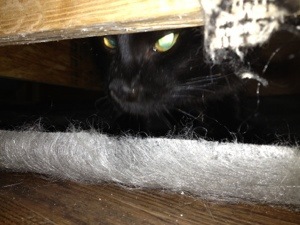 I figured out Blaze crawled under the couch and got stuck and Viktoria was just freaking out. I was trying to coax Blaze out from under the couch when I turned around and Blaze was standing behind me. Wow, what a deal! A couch AND a cat… must be your lucky day. I’m sure Blaze and Viktoria feel the same way. They were so pissed off. Blaze just ran and hit but Viktoria was not a happy cat.